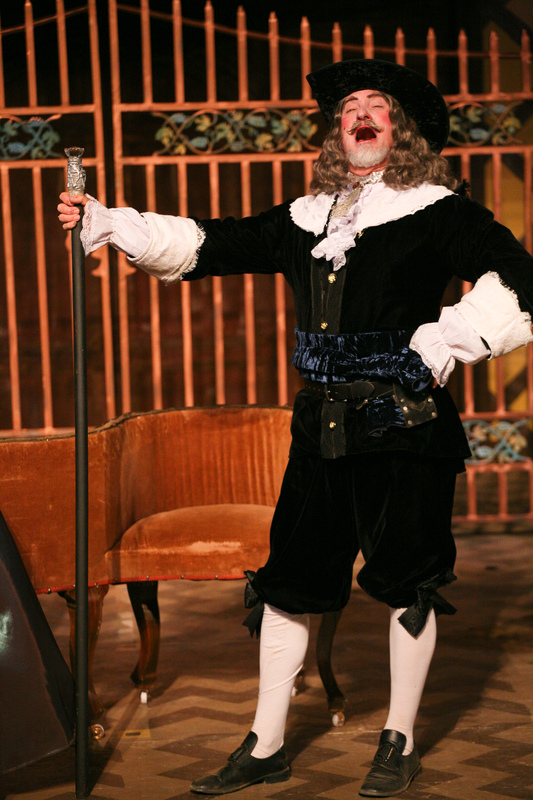 Classic French comedy, performed in the pompously overwrought and flamboyant acting style perfected by the Comedie–Francaise, is reputed to be the funniest stuff imaginable on stage. With David Ives‘ adaptation of Pierre Corneille‘s 17th century masterpiece, The Liar, Marin Shakespeare Company delivers exactly that. Dorante, a young law student, arrives in Paris and immediately attempts to seduce Clarece, with a trumped up story about his nonexistent military exploits. Later, he tries to avoid an arranged marriage by creating an imaginary secret bride. In the course of the play, his lies become increasingly complex and outrageous and the resulting situations more and more unmanageable. Added to all this are typical comic complications of mistaken identities, mysterious twins, wronged fathers, pompous aristocrats, clever servants and desperate lovers. All of this madness is delivered in David Ives rhythmically rhymed couplets which owe as much to modern rap as to Pierre Corneille. While the style of the production scrupulously and uncompromisingly adheres to the classic Restoration manner in all its glory, the lines themselves have been brilliantly and wittily modernized. The virtuosity of playwright Ives’ rhyming brings to mind both Cole Porter and Eminem at their absolute best. It is a seemingly endless rapid fire assault of good puns and bad puns, rhymes clever, silly, surprising and unlikely and just plain goofiness. It is difficult to imagine how the actors manage not to giggle in performance. Rehearsals must have been a hoot. Director Robert Currier obviously loves this play, and has made the effort to see that every detail is polished, from language to gesture to the excellent set and costume designs of Mark Robinson and Abra Berman. Jarion Monroe is a hoot and a half in the supporting role of Geronte in Marin Shakespeare Company’s presentation of David Ives adaptation of The Liar by Pierre Corneille. Photo by: Eric Chazankin. Darren Bridgett, as the liar Dorante, gives a superb physical performance, squeezing every ounce of humor from each flamboyant gesture. His pomposity is truly delicious, but never erases the essentially sympathetic qualities of the character. His handling of plumed hat, lace handkerchief and rapier are a delight. As his servant, Cliton, Stephen Muterspaugh provides an excellent comic foil. Natasha Noel in the role of twins (one a party girl, one a puritan) is very funny as are Cat Thompson and Elena Wright as the feminine love interests. Jarion Monroe as Dorante’s father, James Hiser as the desperate suitor Alcippe and Scott Coopwood as his friend Philiste are all excellent and speak the verse with great clarity and naturalness. This is about as funny as funny gets. The Liar continues outdoors at the Forest Meadows Amphitheatre on the campus of Dominican University through September 23. For further information, click here. “The Liar” by Pierre Corneille, adapted by David Ives, produced by Marin Shakespeare Company. Director: Robert Currier; Set Design: Mark Robinson. Costume Design: Abra Berman. Lighting Design: Ellen Brooks. Properties: Joel and Toni Eis. Dorante: Darren Bridgett. Geronte: Jarion Monroe. Cliton: Stephen Muterspaugh. Clarece: Cat Thompson. Lucrece: Elena Wright. Alcippe: James Hiser. Philiste: Scott Coopwood. Isabelle/Sabine: Natasha Noel. Posted in Reviews.Tagged Abra Berman, Cat Thompson, Darren Bridgett, David Ives, Elena Wright, Ellen Brooks, James Hiser, Jarion Monroe, Marin Shakespeare Company, Mark Robinson, Natasha Noel, Pierre Corneille, Robert Currier, Scott Coopwood, Stephen Muterspaugh, The Liar.